The Lincolns have been immortalized in countless works, but Keckley’s story has really been told only once—and that was in her own controversial memoir, published in 1868. Meticulously researched as well as highly imaginative, MRS. LINCOLN’S DRESSMAKER brings an all but forgotten piece of history back to life. Born into slavery, Elizabeth Keckley earned freedom for herself and her son by the skill of her needle. She moved to Washington, DC, where she quickly made a name for herself as the city’s most talented dressmaker. It didn’t take long for Washington’s political and social elite to take notice of her intricate designs, flawless needlework, and the flattering fit of her dresses. After moving into the White House, Mrs. Lincoln called upon Keckley to be her personal modiste—but she soon became much more. A devoted friend, Keckley supported Mrs. Lincoln through political scandal, the loss of a child, her husband’s assassination, and her eventual descent into poverty. Chiaverini is no stranger to creating poignant and relatable historical fiction; her long-standing Elm Creek Quilts series has hit the New York Times bestseller list fourteen times. She is often praised for her ability to create complex characters and powerful story lines that bring history to life in her novels. An engaging story of strength and perseverance, MRS. LINCOLN’S DRESSMAKER illuminates the remarkable friendship between a First Lady and an extraordinary freedwoman. Jennifer Chiaverini is the author of the New York Times bestselling Elm Creek Quilts series, as well as five collections of quilt projects inspired by the novels. 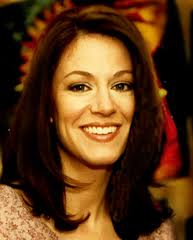 A graduate of the University of Notre Dame and the University of Chicago, she lives with her husband and sons in Madison, Wisconsin. When the folks at TLC Book Tours invited me to read and review the paperback version of Jennifer Chiaverini’s bestseller Mrs. Lincoln’s Dressmaker, I jumped at the chance. After all, I grew up with a mother who sewed (and still sews – calling herself a ‘sewist’) most of my clothes until I finally asked for a pair of store-bought jeans, thus breaking her heart. As well, I’m a history buff, and novels like this – fiction based in truth – are novels I usually enjoy. I ended up reading this novel as the local NPR station began airing nearly daily stories about the 50th anniversary of the assassination of President Kennedy, which made an interesting juxtaposition. Parallels about those two presidents abound, and I won’t go into them here, but I will say that I was completely entranced by Elizabeth Keckley’s story, and I was willing to accept the author’s blending of fact and fiction as plausible. At times, even when the scenes foreshadowed dark events to come, there were moments that made me smile. When Mrs. Davis (as in Mrs. Jefferson Davis) invites the freedwoman to come south with her, during the secession, I could imagine myself snarkily replying with a firm, “Um thanks, but…no,” and had to grin at the very notion of such an invitation. That Elizabeth responded with grace and poise says as much about Chiaverini’s ability to draw three-dimensional characters as it does about my own worldview. While it would be impossible to tell this story without talking about the politics of the day, Chiaverini manages to turn events that still resonate through time into more of a rich quilt that serves as backdrop and connection to the more human, less political story of Elizabeth, of Mary Lincoln, of other women, both black and white, free and slave, who were just as involved, even if their involvement was less visible than the men of the day. Chiaverini, of course, is best known for her Elm Creek Quilt series, so it’s fitting that one of the connective threads of this novel is also a quilt, one that Elizabeth works on, made from scraps of the dresses she designs and sews in her titular role. Quilts tell stories as rich and vivid as words do, and each stitch represents a tear, a chuckle, a dream, a desire, or a disappointment. 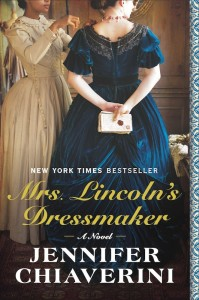 In Mrs. Lincoln’s Dressmaker, Jennifer Chiaverini gives us no disappointments, only real women against a tapestry of war, peace, blood, death, and, ultimately…hope. Goes well with: roasted chicken and rosemary red potatoes, and cool apple cider.